I don’t need to tell you how chaotic New York has been after the big snowstorm. We’ll re-schedule the interview with Chuck Scarborough of WNBC-TV once the weather improves. See you then. I’m thrilled to tell you that my new memoir, Something to Prove: A Daughter’s Journey to Fulfill a Father’s Legacy, is getting lots of attention from TV, radio, print and online media. Hope you’ll tune in. Let me know if there’s something in particular you’d like to know more about when I’m on the air near you. Most people know that daily low-dose aspirin is often prescribed by doctors to help prevent heart attack and stroke. Now, a new study shows that aspirin may help prevent cancer, as well. We’ve known for some time that people who take aspirin appear to have lower incidences of certain cancers, but this study, published in the December 7, 2010 issue of The Lancet, and authored by Oxford University neurologist, Peter Rothwell, offers far more convincing evidence than we’ve had to date. Rothwell analyzed eight previous randomized, controlled studies, that studied the effects of regular aspirin use among more than 25,000 people. About half were given a daily low-dose aspirin (equivalent to a “baby” aspirin) and the other half were given a placebo. Those on aspirin had a 21 percent lower death rate from solid tumor cancers. “Deaths from esophageal cancer were reduced by 60% in the aspirin-takers (who took the drug for at least five years), compared with the placebo group. Lung cancer deaths were reduced by 30%, colorectal cancer deaths were cut by 40% and prostate cancer deaths were lowered by 10%, compared with the patients who got placebo. Does this mean that everyone should take aspirin? Well, no. Even that innocent looking little pill you buy over-the-counter at the drug store comes with some very serious potential side-effects. Bleeding in the gut, caused by aspirin, can, itself, cause serious illness and even death. Only use aspirin on a regular basis – or any other drug, over the counter or not –if your physician has recommended it and is monitoring your use. But if your doctor already has put you on an aspirin regimen, it’s good to know that you might be getting a very valuable side-benefit. The Book Launch Party Was a Blast! Thanks to everyone who came to the party to help celebrate the launch of my new memoir, Something to Prove. It was a roaring success — and it was great to see you there. 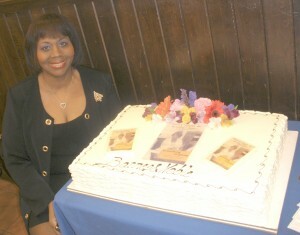 Here I am, next to the party cake (it was delicious) with images from the book cover on the icing. You probably already have a hectic life that just got that much more hectic with the added responsibilities of the holidays. We women often feel pressure to do it all, and to make the holiday special for everyone else. But sometimes, we forget ourselves in the process. So, I thought I’d offer a few tips to plan a holiday that you can enjoy as much as your family and guests. 1. DON’T SHOP UNTIL YOU DROP: I know that budgets are tight for many, many people this year. So, resist the urge to splurge. Even if money isn’t an issue, time is. Don’t try to buy everything at once. Shop in the way that makes the most sense for you, whether that means strolling the mall or surfing the web. 2. LEAVE THE HAUTE CUISINE TO THE FOOD NETWORK GROUPIES: Having company over? Prepare what you can a day or two before, and keep it simple. Forget Mastering the Art of French Cooking this season. Your guests are there to see you, not the Iron Chef champion, so set things up in a way that lets you enjoy the celebration, too. 3: COUNTER THE CALL OF THE BUFFET TABLE: No matter how hard we try to stick to our eating plans, the holidays make it difficult. Fill up your plate with veggies and salad, and leave just a small space for the too-good-to-resist high calorie treats. Balance the inevitable extra calories with an extra walk around the neighborhood after meals. You’ll feel better, and you won’t have to hide the bathroom scale. 4: MAKE YOUR OWN SEASON MERRY AND BRIGHT: Be good to yourself this season. Check the local listings for gatherings that might be fun, or for church choir concerts. Go to a holiday movie. Re-connect on the phone or online with friends and family who have moved away. One of the most rewarding things you can do for yourself is to help those less fortunate. Donate to a food pantry. Visit a senior citizens home. Offer to take a shelter dog for a walk. I know how tough it is for women to follow this simple advice (hey, I’m a woman, too), but I also know we’ll feel better if we do. So, I’ll try if you will. Meanwhile, please stop by if you’re in the New York tri-state area for my book launch party at Barnes & Noble in West Nyack this evening for my new memoir, Something To Prove: A Daughter’s Journey to Fulfill A Father’s Legacy. Details are here.